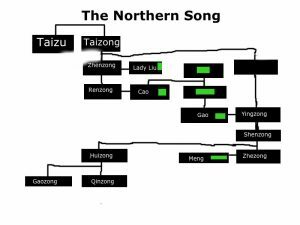 The first part of the Song Dynasty is called the Northern Song. In 960 AD, one of the generals of the declining T’ang Dynasty managed to reunify China under his control. This general’s name was Chao K’uang-yin, but once he became emperor he renamed himself Song Taizu. The old Han Dynasty examinations became more and more important to Chinese government, and from the Song Dynasty on, these examinations were really the only way to get political power in China. Song Taizu was a Buddhist, who sent 150 Buddhist monks from China to India to be educated there, and opened many new universities and schools in China. Song Taizu was a strong emperor who kept the army firmly under his control. When Song Taizu died in 976 AD, his brother Song Taizong took over. A popular story from the 1000s claimed that Song Taizong had murdered his older brother to get power, but that’s probably not true. Song Taizong worked hard and did a good job. Like his older brother, he reunified China and centralized power using the government examinations, and encouraging scholars to write encyclopedias. He built a lot of new roads and buildings. Song Taizong’s son Zhenzong took over in 997 when he died. 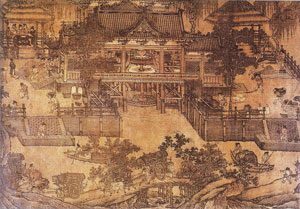 Song Zhenzong immediately moved his wife, Lady Liu, into the palace, and she worked closely with him as a partner. Song Zhenzong centralized power even more. He imported rice seed from the south to the north that could produce more rice on the same land. Other good rice – champa – originally from India came north to China from its new colony in Vietnam. At first Zhenzong fought the Khitan in the north, but in 1005 he made a treaty with the Khitan’s Liao Dynasty that kept the peace. China had to pay the Liao kingdom a lot of silver and many yards of silk every year to keep the peace. Song Renzong also kept the peace, both inside China and with China’s neighbors. His wife Empress Cao ruled alongside him. Inside China, Song Renzong and Cao were careful with money, and limited the use of the death penalty. They encouraged education, and many poets and writers. They didn’t conquer their neighbors, so their China was not as big as it had been under the T’ang Dynasty. In 1044 they made peace with the Western Xia in the north-west. They agreed to pay a lot of gold to the Xia every year in order to keep them from attacking China (You could call that tribute, or you could call it taxes). Whatever you call it, paying gold to the Khitan and the Xia meant that poor people had to pay high taxes, so they were unhappy about that. Some people wanted to keep making the payments anyway, and other people thought it would be better to try to fight the northern invaders off. These two groups kept fighting with each other. First one would get into power and then the other, but Song Renzong and Cao kept power for a very long time. 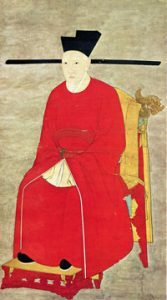 Song Renzong died in 1063 AD, when he was fifty-three years old. His sons had all died young, so his cousin took power: Song Yingzong. Yingzong was only 31 years old but he was always sick, so Empress Cao ruled for him. Empress Cao arranged for Yingzong to marry her niece, Gao. But when Song Yingzong died after only four years, his son Shenzong took over. Shenzong was only nineteen years old. Empress Cao still stuck around to help him, but Shenzong’s main adviser was Wang Anshi. Together, they put in the New Policies, to help poor people. They made loans to farmers so they could buy seeds to plant. They paid people who worked building roads and canals, instead of making them do it as a tax. They made more copper money so people could buy things. They added law, medicine, and military knowledge to the official examinations. And they created a welfare system to support old people and people who were unemployed. Wow, that was all a big help to people! Sadly, Shenzong died in 1085, when he was only 37. Yingzong’s widow, Empress Gao, took over as regent for her grandson, Zhezong, who was only nine years old. Gao didn’t support the New Policies. She returned to older, more conservative ways of doing things. Gao ruled until she died in 1093, when she was 61 years old. Zhezong was now seventeen, and he was happy to take over because he hated his grandma’s conservativism. He brought back the New Policies and lowered taxes, but the conservatives and the reformers kept on fighting. Zhezong didn’t have long to rule, because he died at 24. His younger brother Huizong took over in 1100. Huizong was more of an artist than a ruler, and didn’t do much. Then about 1110 AD, Huizong made an alliance with the Jurchen of Manchuria to fight the Khitan and get them out of China. It worked great! But once the Khitan were out, in 1115, the Jurchens took over the Song capital of Kaifeng. The Jurchens took the emperor and his son prisoner, along with their whole family. The second part of the Song Dynasty is called the Southern Song. Another son of Huizong’s ran away to southern China and in 1126 he started a new Song Dynasty with its capital at Hangzhou. He took the name Gaozong. Gaozong and his successors were not very strong militarily, and could not take back northern China from the Jurchen. But they did develop thriving trade. Because the Jurchen had cut off their traditional route along the Silk Road, traders began sailing to Southeast Asia and to India to get pepper and cinnamon and sugar, and to sell silk and tea. Paper money helped to create growth in the economy. Iron-workers started to burn coal for fuel. In the 1230s, the Song Dynasty made an alliance with the Mongols to get rid of the Jurchen. Again, the plan worked, but the Mongols took over northern China instead. In 1279 AD the Mongols came even further south and killed the last of the Song emperors. Daily Life in China, on the Eve of the Mongol Invasion, 1250-1276, by Jacques Gernet (1962). The Inner Quarters: Marriage and the Lives of Chinese Women in the Sung Period, by Patricia Buckley Ebrey (1993). Cite this page: Carr, K.E. Song Dynasty China – Medieval China. Quatr.us Study Guides, June 6, 2017. Web. April 19, 2019.